In the last year, it’s been my honor to preside as we celebrate this major milestone, the centennial of the A. B. Freeman School of Business. We kicked off the festivities last fall with a party on campus for students, and we celebrated throughout the year with centennial themed activities and a special website dedicated to Freeman School history. The Association to Advance Collegiate Schools of Business (AACSB), the leading accrediting body for university business education, has approved the re-accreditation of all degree programs at the A. B. Freeman School of Business. Teddy Nathan, a current PMBA student, and colleagues Zach Cheney and Melissa Garber earned the $5,000 grand prize with their pitch for Crescent City Connections, which works with local nonprofits to create customized volunteer experiences for tourist groups. Tympanogen, a biomedical startup founded by Tulane biomedical engineering doctoral students Elaine Horn- Ranney (SE ’14) and Parastoo Khoshakhlagh (SE ’17), took home the grand prize of $25,000 at the 2014 Tulane Business Model Competition. The scene may sound like something out of a trendy restaurant, but the dining room is actually an MBA classroom. Francisco “Paco” Robert (MBA ’11) brought his fast-growing startup Dinner Lab to the Freeman School last fall for a live case study on the innovative supper club. Christopher Conoscenti (MBA/JD ’01) has served as a judge for the Rolanette and Berdon Lawrence Finance Case Competition for the past five years, but he says the 2014 contest, which took place at the Freeman School on March 28, was without a doubt the toughest yet. 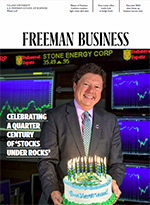 To commemorate the Freeman School’s 100th anniversary, NASDAQ sent out a special congratulatory message via its famed MarketSite Tower in Times Square. A Texas-based convenience store chain was sold just three days after its executives presented at the 18th annual Burkenroad Reports Investment Conference. As director of the Burkenroad Reports program, Peter Ricchiuti has spent more than 20 years highlighting the small, profitable companies that often fly under the radar of Wall Street. Now, Ricchiuti has collected some of the lessons he’s learned over the years in a book. As John Trapani listened to the names of graduates at this year’s Freeman School diploma ceremony, a thought struck him: Nearly half of the 700-plus degree recipients were from outside the U.S.